Cloth diapering has come a long way from bulky fabrics, pins, and “rubber pants.” Asking the question, how can we make a better cloth diaper, has inspired many inventive and entrepreneurial cloth diapering parents to develop a plethora of products and brands. While customer choice is great, it can also be overwhelming; especially for a first time cloth diapering family. To help you sift through all the cloth diaper choices out there, here are some things to look for in a cloth diaper brand. Reputation is everything and in the age of social media there is a treasure trove of information and feedback about cloth diaper brands online. Now before gluing yourself to your computer, we recommend looking to see if you have a local cloth diaper retailer. Cloth diaper retailers know the industry and getting your hands on some cloth will give you the best sense of a specific brand’s feel and quality. If you’re in my sister, Bert’s, area around the Twin Cities you’ll want to check out Lil’ Tulips in Still Water, Minnesota. They carry a wide variety of cloth diapers and would be happy to help you sort through all the different brands. In my area I love that I have a couple of options. There are two cloth diaper stores: Birth, Baby, & Beyond and Baby Time not too far away in Cedar Rapids, IA. Also Tiny Feet Boutique & Play Space in nearby North Liberty, IA has a limited selection of cloth diapers. Don’t worry if you don’t have a local cloth diaper retailer. There are some great online groups to connect you with other cloth diapering families like the Cloth Diaper Experiment on Facebook. Many retailers, especially the larger online retailers like Kelly’s Closet and Diaper Junction have Facebook support groups. These are great places to find experienced cloth diapering folks who are happy to give you a non bias opinion about various cloth diaper brands. Another great source of information are cloth diapering bloggers. Experienced cloth diapering bloggers have not only used and reviewed several different brands of diapers, but many of them have also collaborated with several brands. This gives them an insider view of the cloth diapering industry. Here’s a Facebook group that will help you find some great cloth diaper blogs: Cloth Diaper Blogs. A blog that is specifically about helping families find the right cloth diaper for their babies is Padded Tush Stats. It’s all about, “statics and reviews to help you find the best cloth diapers for your baby.” Finally, most reputable cloth diaper brands are members of the Real Diaper Association. Remember my suggestion of getting your hands on some cloth? Once you do, you’ll be able to get a feel for each brands’ quality. Be sure to check all the diaper’s various components: the external waterproof material, leg and waist elastics, and closures (snaps or hook & loop). Do the materials seem to be good quality and durable? Does the diaper appear to be well-made? Does the diaper’s design seem straight-forward and easy to use? Asking these questions while actually handling some cloth will help you determine if that brand is a good fit for you. A company’s customer service, or lack there of, is a major indicator of the quality of that brand. Good, or bad, customer service is something brands can get a reputation for so this is something to ask about when looking into different cloth diaper brands. Reputable cloth diaper brands will have trouble-shooting, cloth diaper guru(s) ready to help customers. Such brands typically provide customers with excellent information and resources for cloth diapering right on their websites. Another thing to look for on a brand’s website is information about their return policy and warranty. A good warranty should cover manufacturing defeats up to one year of the original purchase date. Finally, you have to find the diaper(s) that work best for your baby, your wallet, and your preferences. Some people fall in love with how a specific brand of diapers fits their baby. Some people value supporting companies that make their products in the United States. Some people are collectors and want to buy all the prints. All these personal preferences will draw you to some brands over others. One of the best things about cloth diapering is that there are a ton of great brands out there. It can be fun to have a mix of brands in your stash. The bottom line is this, if you know what you’re looking for in a cloth diaper and the brand behind it, you’re bound to find the perfect cloth diaper brand for you! 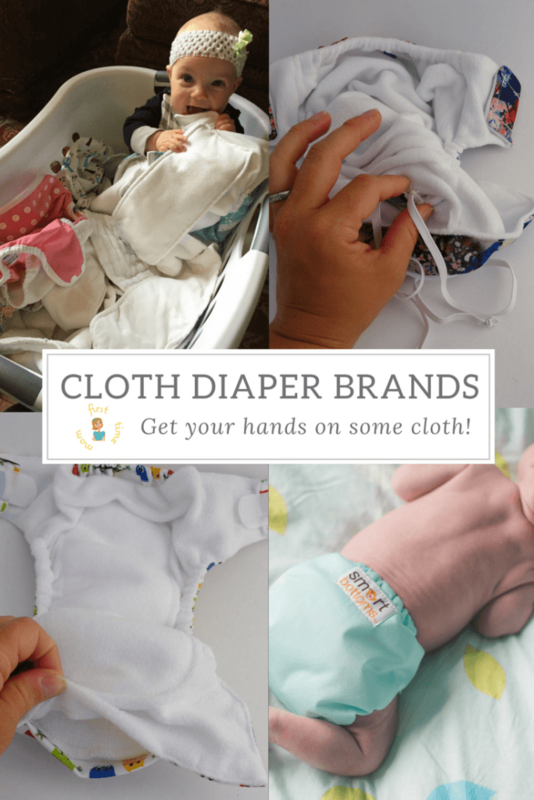 We hope this post has given you a starting place for find your favorite cloth diaper brand. 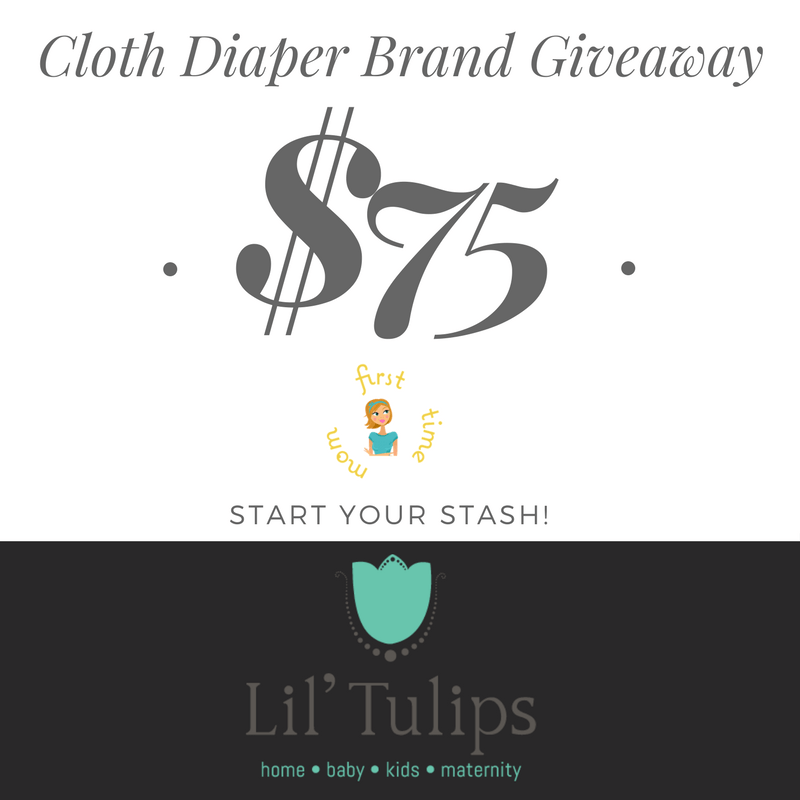 Our friends at Lil’ Tulips want you to explore the wonderful world of cloth diaper brands and start your stash. One lucky First Time Mom reader will win a $75 gift card to Lil’ Tulips. Simply fill out the giveaway form below to enter. Happy cloth diapering! I love using cloth, but after somehow ruining the waterproof part of half my stash, ( seriously I have no idea how I did it except the fact that some are just old) I might be looking at expanding my stash to other brands. That’s too bad Steph! What brands were you thinking of? I have no idea yet. A friend uses Charlie Bahama so I might go with those. We have bumgenius right now. My son has super sensitive skin so I am trying to find a detergent that will work with our hard water. Right now he’s in disposables part time because it just makes life easier. My youngest is in sposies too right now. I never used CB but I used BG (like old school the 3.0’s), Thirsties and Smart Bottoms. If your son has sensitive skin you may consider using natural fiber diapers and top them with a stay-dry liner of some kind. Lil Tulips is awesome! They have helped me find all sorts of solutions to issues we have had. Most of our stash is second hand, but sometimes it’s fun to splurge. We don’t have one brand we are totally loyal to, rather a few we like for different reasons. Yes, we love them too!!! We love our Cloth diapers! Also what fits one of your kids may not fit another. I have one who fits Thirsties better and one who fits in smartbottoms better. And trial and error is a great way to troubleshoot. I look for quality at an affordable price. I have had expensive diapers that were awful and inexpensive diapers that were great. So glad this helps! There is a lot of sort through when starting cloth.